Shower Chairs from Invacare offer stability, comfort, and tool-less assembly in seconds. The all-composite legs of this Shower Chair has precise twist height adjustments from 15" to21". Deep contoured seats and ergonomic backrests provide maximum showering comfort. The Invacare Shower Chair fits into most standard tubs while offering large rubber tips on the legs for additional stability. The Shower Chair has a weight capacity of 400 lbs. and uses Microban technology. Invacare also manufacturers the Invacare Shower Chair without Back. 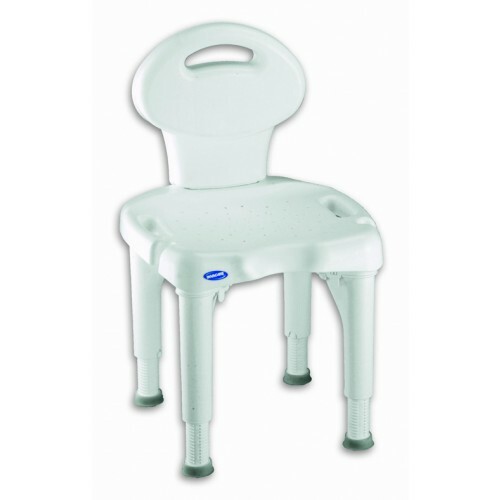 Invacare Shower Chairs Product Numbers: 9781M, 9780M. Seat Height: 15" - 21" adjustable. Weight (Shower Chair without Back): 8.25 lbs. Weight (with back): 10 lbs. Invacare Shower Chair Warranty: Limited lifetime. What measurements are dimension, base depth and base width? I have Parkinson's and needed a shower chair for my narrow 18-inch tub. This chair fits and so I sits! It works great for me and the back support is comfortable. I put it together myself. Since I do not have much upper body strength, I used a mallet to hammer in the legs. 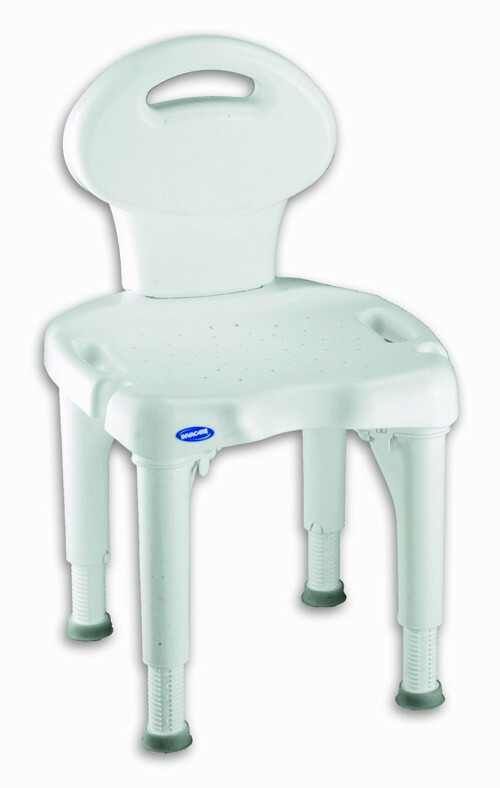 This chair makes me feel more secure than the previous shower stool with no back. I would highly recommend. Thank you! Allows Mother in law to bathe without any problems. Great product. Shower chair is working out very well. It is sturdy and easy to clean! And---no parts to rust! Also, I had it 2 days after I placed the order!! It is a good sturdy chair and easy to assemble. It was a perfect fit for a older type narrow tub. Shower Chair that is easy to put together! The chair is sturdy and easy to put together.